First annual International CrowdFunding Film Festival , ICFFF.org brings together artists, filmmakers, and video game creators to showcase their talent . Crowdfunding is changing the production landscape in the movie industry. 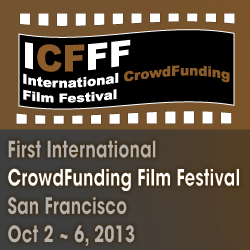 The First annual International CrowdFunding Film Festival will be held October 2-6, 2013 in San Fransisco. The film fest to bring together artists, filmmakers, and video game creators to showcase their craft, network and get crowdfunded. The film festival has plans to collaborate with film schools in New York, London and Paris. Film students from universities all around the country are increasingly looking to crowdfunding to find backing for their projects. With over countless films successfully funded through crowdfunding portals such as Kickstarter and IndieGoGo, Hollywood is now paying close attention to all this movement. Director/Writer Rob Thomas has raised over $5.7 million for his movie “Veronica Mars” while Zach Braff’s feature “Wish I Was Here” has raised $2.6 million in donations. San Francisco State Student Sterling Cook keen on exploring crowdfunding of finance for production projects. “I see in these directors, writers, and cinematographers, the same core passion for innovation. They are not only artists but more importantly, entrepreneurs - they are seeking to touch the world and make a difference through their films. We know of their struggle to find financial backing and I believe crowdfunding will be the answer,” says ICFFF's Sydney Armani organizer and publisher of CrowdfundBeat.com. Ted Hope, advocate of America’s Independent Cinema Movement and Executive Director of the San Francisco Film Society, provides deeper insight into the current state of the film industry in his blog post "Why I Left New York for the San Francisco Film Festival." He says, “Our entertainment economy and the art it supports, was built upon the concepts of scarcity and control, but today’s reality is one of super-abundance and access - the exact opposite. To survive and flourish, today’s artists/entrepreneurs--and those who support them--must all embrace practices that extend beyond the core skills of development, production, and post-production of their art and reach beyond the attention and practice of marketing and distribution.” The meaning behind Hope’s words echoes the exact spirit and foundation that is the core of Silicon Valley’s passion for entrepreneurship and reflects the same spirit represented by the film festival.